Major in Revolution, a commander at Kings Mountain, Congressman, state legislator. Town of Winston named for him. Home was 4 mi. 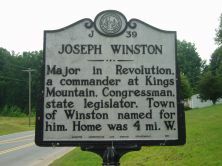 W.
Joseph Winston, Revolutionary War officer, legislator, congressman, and Winston-Salem namesake, was born in Louisa County, Virginia, on June 17, 1746. As a young soldier in the French and Indian War, he received his first wound during a battle against Indians in September of 1763. Around the late 1760s or early 1770s, Winston moved to North Carolina and settled on the Town Fork of the Dan River in Surry (now Stokes) County. Winston served Surry County as a delegate to the 1775 and 1776 Provincial Congresses in Hillsborough and Halifax. His 1778 appointment as the county’s register of deeds enabled him to interact with the Moravians of Salem as they secured deeds to the Wachovia settlement. The relationship he established with them was an important one to his political career. As first major of the Surry County militia he led his fellow patriots at the Battle of Moore’s Creek Bridge, in parts of the Cherokee campaign under [Griffith Rutherford, L-21, in defeating Tory forces at [Kings Mountain, O-1], and at the Battle of Guilford Courthouse. Off the battlefield, Winston was a Surry County representative in the House of Commons in 1777, 1779, 1782, and 1783. While serving as a North Carolina Senator from 1787 to 1789, he proposed dividing Surry County to form Stokes County, which he served as Senator in 1790, 1791, 1802, 1807, and 1812. He took a seat in the Third (1793), Eighth, and Ninth (1803-1807) United States Congresses representing the district composed of Surry, Stokes, Iredell, Wilkes, and Ashe counties. Away from state and national politics, at various times he served terms as a trustee of Salisbury Academy, the University of North Carolina, and Germantown Academy. Joseph Winston was married twice, first to Jane Dalton in 1769 and later to Minerva Elizabeth Lanier. He had at least twelve children, including a set of triplets. 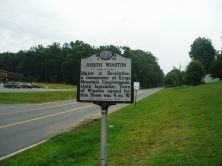 Winston died on April 21, 1815. He was first interred in the family cemetery near Germantown, but in 1906 was removed to the Guilford Court House Battleround. When Forsyth County was formed out of Stokes County in 1849, Winston, the county seat was named for him. The towns of Winston and Salem were consolidated in 1913 to become Winston-Salem.